In an ideal resistance, the voltage-current ratio is linear and the resistance value remains constant. However, in general, in reality the resistances are non-linear due to the effects of temperature. As the current increases the temperature increases, resulting in greater resistance. The resistor allows us to control the current in the circuit according to our need. In addition, a real resistor has a limited power dissipation capacity that is designated in watts, and may fail after this limit is reached. Resistance of carbon composition: Made of carbon powder or graphite paste, low power values. Film or Cermet resistance: made of conductive metal oxide paste, very low voltage values. Wire coil resistance: metal bodies for heat sink assembly, very high power ratings. 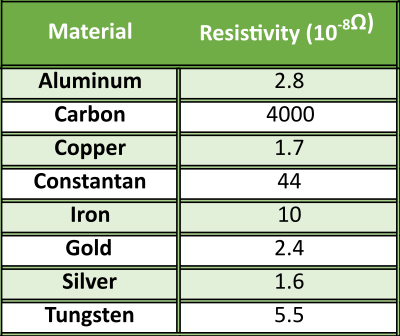 Semiconductor resistance: High frequency surface mount thin film technology – precision. How is the resistance calculated? The resistor has a maximum power which allows it to dissipate the current in the form of heat. The most common values are ¼ watt and 5% tolerance for common uses, power electronics and more specific projects will use heavier dissipation resistors. The ¼ watt rating means that the resistance can fail if it is required to dissipate more power than this one. The metal film precision resistors have uncertainties less than or equal to 1% and are available in a wide range of values compared to those of lower tolerance. How do you know the value of a resistor? The three important values that we must know are the electrical resistance, maximum dissipation and tolerance. These values are indicated in the package depending on the type of this. The first step for reading a resistor is the understanding of what each band means. The first band that corresponds to the left end is the one that represents the most significant digit of the resistor. The third band represents the third most significant digit of the resistance. The fourth band represents the power of 10 raised to the corresponding color and multiplied by the first, second and third bands. The fifth band represents the tolerance of the resistance. As the temperature of the environment increases, the resistance of the material changes. The reason for this change is not due to variations in the dimensions of the material, but to the change in the resistivity of the material. When there is an increase in temperature, the heat will cause an atomic vibration and these vibrations will cause a collision between the free electrons and the electrons in the inner layers of the atom. These collisions will use the energy of free electrons. If more collisions occur, more free electron energy is used and the resistance to current flow increases. This is the case in conductors. In the case of insulators, the resistance decreases with the increase in the temperature. The reason is the availability of the amount of electrons that are released from their captive stage. In mathematical terms, a fractional change in resistance is directly proportional to the change in temperature. Where α is the temperature coefficient of the resistance. The resistance temperature coefficient is used to describe the relative change in resistance in association with the change in temperature. If the resistance increases, then it is said that the material has a positive temperature coefficient. We can identify these materials as conductors. If the resistance decreases with increasing temperature, the it is said that the material has a negative temperature coefficient. We can identify these materials as insulators. It is the theoretical value expected at the end of the manufacturing process. Difference between the upper and lower deviations. It is given in percent. It gives us an idea of the precision of the component. When the value of the tolerance is large we can say that the resistance is not precise, however when this vale is low the resistance is more precise.